With springtime almost here, Osage County residents will have an opportunity to learn more about severe weather during a weather spotter training to be held at 7 p.m. Thursday, March 13, at Lyndon High School auditorium. Every year, the National Weather Service of Topeka presents severe weather safety and information talks which are open to the general public. Presentations are typically around 90 minutes long, and are given by a meteorologist from the Topeka office. The 2014 show will focus on severe storm safety, preparedness, and awareness. Storm structure and accurate identification of important cloud features associated with super cell and squall line thunderstorms are also touched on. Also at the event, Osage County residents will be able to purchase weather radios at a discounted price of $12. The Midland HH54VP2 weather radios are being offered by Osage County Emergency Management, with a limit of one radio per household or business. For more information about the weather talk or weather radios, contact Bryce Romine, Osage County Emergency Management, at 785-828-3323. 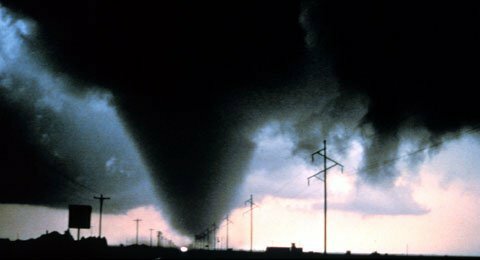 NWS will be offering another severe weather talk at 7 p.m. March 18 at Lyon County Fairgrounds, Bowyer Building, U.S. Highway 50 and Industrial Road, Emporia. See this page for more information about area weather talks. Photo thanks to NOAA Photo Library, NOAA Central Library, OAR/ERL/National Severe Storms Laboratory.